Successful covered call writing requires proper stock and option selection. With the significant increase in our premium membership subscriptions over the past several months we have received dozens of inquiries as to how best to incorporate the stocks on the ‘running list”, our watch list, into our portfolios. The Premium (BCI) Report takes the universe of 8000 securities and screens it into a workable list of 40-60 stocks in most weeks. The question has come up as to how to reduce this list into the equities we will include in our current portfolios. In other words, how do we determine which of these stocks to buy as our underlying securities? One of the incredible features of this tool is that you can tailor the list to your specific priorities and risk tolerance. In this article I will demonstrate several approaches members can take to make our final decisions. 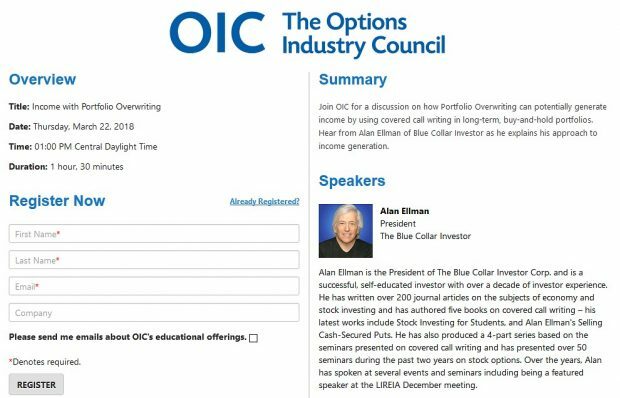 The flexibility we have is a testimonial to the amount of information incorporated into this tool and for that I send my kudos to Barry Bergman (Director of Research for The Blue Collar Investor) who oversees the production of this weekly report and the BCI team members. The yellow fields highlight stocks in bold which mean they passed ALL screens and have ALL confirming technical indicators. These are the technically strongest stocks at the time of report publication. I have highlighted in the green fields some of the stocks with industry segment ranks of “A” putting these industries in the top 20%. The purple fields highlight stocks with low betas. Low beta stocks tend to outperform in bearish markets. In bull markets we may favor high beta stocks. The pink fields highlight securities with decent dividend yield. If there is no entry in this column the stock has no dividend at this time. I have drawn red arrows adjacent to the stocks that have been on our premium watch list for multiple weeks in a row. For example, at the time of this report ORLY had been on the list for 20 consecutive weeks. The BCI Premium Stock Report is a tool designed to save our members an immense amount of time. It screens the universe of over 8000 equities into a manageable list of 40-60 securities. At that point you can use your personal preferences and risk tolerance level to make your final selections. If your portfolio requires 5-7 equities, select about 10 stocks from the list and use the Ellman Calculator to make final selections. We report, you decide! Once you use the process for a few months it will become second nature as you use the report to maximize your profits to the highest possible levels. The Conference Board’s Consumer Confidence Index reading of 69.5 was lower than the expected reading of 69.7. However, the reading remains much higher than the recent October low of 40.9. For the week, the S&P 500 rose by 1.8% for a year-to-date total of 12.3% including dividends. BCI: Cautiously bullish favoring in-the-money strikes. What is the significance of the rows in gold on the top of the first chart? The rows in the “Gold” section indicate all of the stocks that have passed the screening process but report their earnings during the current option period. We highlighted these stocks to make sure that the reader didn’t accidentially select a stock from the list that was reporting before thevrnd of the option period. Since all of the stocks in the “Running List” are sorted by ER Date they become eligible for inclusion in your personal watch list as soon as they report. We also have the CONFIRMED ER Date identified with bold-red font as soon as we determine that the ER Date is confirmed using Earningswhispers.com. I just ordered your DVD-new book package. Do you discuss this report and provide information on things like beta in the new book? Looking forward to learning the system and planning to become a premium member. Yes. Beta is discussed in the DVD-Book package. In the “Encyclopedia….” check out pages 175-177 when you receive it. The Weekly Report for 04-27-12 has been uploaded to the Premium Member website and is available for download. Here is an example of an approach that you can take based on this week’s blog article. Keep in mind that our members can use this list in a myriad of ways based on your risk tolerance, portfolio size and persponal priorities. 1- Print out the list that was uploaded to your premium site last night. 4- Let’s make our primary priorities (in this hypothetical) technical strength and industry strength. This means we will look for stocks in “bold” and industry rank of “A”. You will find that the list is now down to 19 securities. Now, before we go to the options chain and the Ellman Calculator we may want to reduce the number of retail stocks since we want a well-diversified portfolio. If we choose to favor the retail stocks that also offer a dividend yield our list would then be trimmed to 14. It could also be reduced by favoring either low or high beta stocks depending on your market assessment. If your portfolio will contain between 5 and 10 equities, this is a manageable amount of stocks to run the calculations on. Once our members become familiar with the report, the entire portfolio selection process should take less than one hour per month. From there, position management kicks in but that also can be achieved in a reasonable amount of time for working folks once the system is MASTERED. Because of the positive feedback I have been receiving about this article, I have archived it in the “resources/downloads” section of the premium site so it will be there as a reference resource. How much do you factor in the IBD 50 rank of a stock? For example, ALXN is ranked #6 this week but is not a stock in bold on this weeks list. Should this stock be given more consideration because of the high rank? When a stock is located on the IBD 50 list, it is ensured of participating in the meticulous screening process of the BCI methodology. It does NOT guarantee that it will “make” the running list. The reason ALXN is not in bold is because of the mixed technicals. Look at the “comments” column on the far right of page 2 of the report. It states that the price is @ the 20-d EMA, the MACD histogram is below zero while the stochastic oscillator shows a bullish signal. Therefore, since this equity passed all other screens but with mixed technicals it makes the running list but not in bold. Do I need to compare the relative strength of my share to the market(S&P500)?, or to the industry/sector group?,- if so then how often do I need to compare this? Inherent in the BCI methodology are screens that ensure that the stocks on our watch lists are among the elite-performers both technically and fundamentally. Therefore, if you follow this system there is no need to create comparative charts with the S&P 500. The same holds true for the industry as the SmartSelect Ratings include Industry RS rankings. I do not use Dow averages but rather the broader S&P 500 charts along with VIX patterns and weekly economic reports to determine market assessment. These are the parameters that work best for me with the understanding that there are many other solid approaches to stock and market evaluation. I wrote the April calls for FIRE last month but didn’t write the May calls due to the earnings report coming out last night. I decided to hold it through the report (held my breath!). Today it’s up 12% and I wrote the 60 calls for another 2.5%. Smart or lucky? Fred, I don’t know if you are smart or lucky but I’m an idiot. When I did my May trades last week one of the ones I bought for the stock and sold the CCs on was HLF. When I drew the reminder lines on my chart, I realized I had messed up and they had an earnings announcement this month. I went back and looked at their stock price on every earnings announcement going back 5 years, and they have a good history of no surprises. So I decided rather than fix my mistake I would let it go. This morning HLF announced earnings. Their stock opened at almost $71 and it is currently at $54. I have 2 contracts so have lost about $3500 on the stock and gained about $1000 on the calls for net loss of about $2500 so far today. What a dolt I am!!! You took an educated risk and lost…it happens. It’s better than suffering an uninformed disappointment because you can avoid it in the future. These are two great examples of the pros and cons of owning a stock through an earnings report. If the underlying stock with good fundamentals like HLF gapped down with no valid reason, how will you manage the stock? Thanks. You will note that HLF is located in the “gold cells” of the “running list” which means that it was NOT eligible at the time the gap down started. Earnings reports are NOT our friends. If you determine that the reason for the gap down is serious enough where the remaining cash can better be utilized in another equity, we must bite the bullet and move on. Today, AME announced a 3-for-2 stock split payable on June 29th. The company also increased its quarterly cash dividend by 50% to an annualized rate of $0.36/share (($0.24 post split). Our premium running list shows an industry segment rank of “B” and a beta of 1.43. See Chapter 12 of “Encyclopedia….” for a detailed explanation regarding contract adjustments for 3-for-2 splits. Alan, for what I know it looks as is there aren’t many charts that you need to see before putting on a trade. I had another question about charts to use(even though I think you’ll say not to need them). So on ‘stockcharts.com’ there is a page that has information where we can compare the different type of indexes, industries, indices, and commodity groups to the market to compare trends,etc. Do you think this is of any use for us to analyse? (if by any chance we could, then which ones above? and how often should I see the charts)? But my question here is that if I didn’t see these premium reports, then would it still be up to me if I wanted to see the Industry (or Sector) chart. (or should I have to in this case.)? Thanks for helping me understand this so far. This is a defensive stock (produces firearms) with a market cap of $1.06 billion. It has beat estimates in seven consecutive quarters with impressive strength and magnitude of earnings. In the recent ER, earnings doubled due to a 49% sales growth. Consensus estimates for 2012 is for 30% earnings growth an d 6% for 2013. Our running list shows that RGR has been on our watch list for the past 7 weeks, has an industry rank of “A”, a beta of 1.13, and a dividend % yield of 1.50%. Another reason that HLF gapped down was an assertion that their business model, MLM, was flawed. This info was published by a consultant that alleged that their business model was a “pyramid scheme” and the person was going to publish his findings in his blog. It was later determined that HLF paid the person approx. $300K not to publish the article. The issue came up during the earnings conference call and the stock then dropped. In this case, the “consultant” was a felon who had previously spent time in prison for similar types of activities. HLF management thought it would be less expensive to pay the consultant than to have to fight a high profile case in court. The take away from this is that a fundamental event…news in this case, earnings in “normal’ times…trumps technicals. That’s why Alan’s #1 rule is NEVER to be in a trade if there is an earnings announcement in the option month. I understand the “don’t own stocks during an earnings report month” rule However, in the 4/20 Premium Report VRX passed all the screens including no ER during the May option month. (The unconfirmed date was, I believe, 5/26.) A week later the now confirmed ER date was 5/3, meaning anyone who purchased VRX based on the 4/20 report was now in possible danger. Perhaps the last column in the Premium Report list should say “CONFIRMED ER this option month” (Yes/No) and leave off stocks that may have passed all screens but hasn’t confrmed their ER date. Just a thought. We highlight all confirmed ER dates in red bold on the Running list as soon as we determine a confirmed date. As noted in Alan’s three books, ER dates do change, so it is important to re-check the date just prior to placing your trade. In the case of VRX… At the time, EarningsWhispers showed VRX ER date at 5/28 showing it not confirmed. Since our “source of truth” is Earningswhispers.com, I was reluctant to change the date since there was no consistency across the sources below. We have found over the years that EarningsWhispers gives us the most accurate and consistent ER Date information. This was brought to our attention back then by another subscriber. We then went to the company website and a subsequent phone call to the Investor Relations department at the company. It took a few days, but we finally resolved the ER date and sent out an update to the Weekly Report. Changing, inconsistent, or inaccurate ER date information is a reality. We try to mitigate the problem by consulting multiple sources as described above. As for your suggestion for the report, the number of eligible stocks would be greatly reduced. The issue tends to occur during earnings season vs. other times. In most cases the confirmed ER date only differs slightly from the unconfirmed date as reported on EarningsWhispers. Since good trade management under the BCI methodology calls for checking the ER date just prior to trade entry, providing the best available ER date information at the time the report is compiled was the best path to take for our subscriber community. I hope this gives you some insight into how we deal with ER dates. Barry… Thanks so much for all the insight into earnings report dates, and the difficulties with confirming them. I am a newbie to BCI and will make rookie mistakes, as I’m sure others have as well. When I saw in the 4/27 report that VRX would report earnings on 5/3, I had a decision to make (being a buy-write owner myself.) I could have closed the position at basically the cost of commissions and walked away on Monday and avoided the problem altogether. I researched what I could find on VRX earnings and all analysts said VRX would beat expectations nicely, and earnings would be up significantly. I took the calculated risk to ride the stock through the ER, which is totally my decision and responsibility. Thursday morning my decision was vidicated with the headline “Valeant Earnings Beat Estimates; Guidance Raised”. The stock shot up $4.50 to $60 at the bell and I was ecstatic. An hour later I came back to check and found another news item: “Valeant posts 1Q loss on dermatology deal costs”. The stock had dropped $11 a share to $49!! A change of underwear and two martinis later, I mused at the irony of having been so right and so wrong at the same time. Better to have got out even on Monday, it turns out. Again, thanks for your time and all the information on ER dates. I will be more vigilant in the future! This pricey stock ($150/share) recently reported its 10th straight positive earnings surprise. On April 27th, earnings per share came in @ $1.94, $0.06 ahead of estimates. This was a 7% increase over the same quarter a year ago. Revenues rose by 31%. Earnings growth is exepected to continue at a double-digit pace over the next few years. Shares trade @ 15.7 x forward earnings, a discount to its industry peers’ 17.4x. VFC has a market cap of $17.1 billion. Our premium watch list shows an industry rank of “B”, a beta of 1.01and a dividend yield of 1.90%. 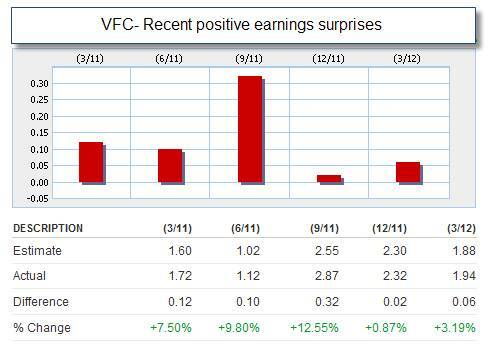 Below is a graph of recent postive earnings surprises. Click on image to enlarge and use the back arrow to return to this blog. Although not part of the BCI methodology, I personally try to stay away from any biotech/drug stock…much the same way that Alan “bans” any retail stock that reports same store sales. Over the years, I have been personally hurt by bio tech and drug stocks, so I tend to avoid those types of stocks. FDA rulings are unpredictable and adverse drug reactions can blow up a stock years after a particular medication is introduced. Interesting that I do not see anybody talking about the size are value of the premium we should be trying to achieve. Can anybody comment on this? Thanks. Steve, I’m sure Barry or Alan will respond but the 2-4% return Alan always refers to is the ROO calculation. The more correctly bullish you are and using ATM or even OTM strikes you’ll make more. The more conservative you are with ITM strikes the less you’ll make, although if you’re bullish and wrong the ITM strikes will lose less so could in fact make a higher return at times. Also, the higher the volatility of the stock the higher the premium and resulting ROO. Of course higher volatility also increases the odds that the stock price will move farther than you think — in either direction. It’s a balancing act and depends on your individual risk tolerance.